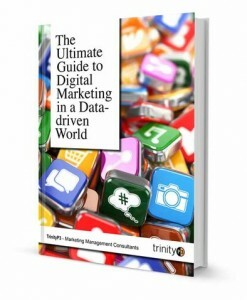 Welcome to the 6th Chapter of “The Ultimate Guide to Digital Marketing in a Data-driven World”. If you missed Chapter 5 you can read it here. 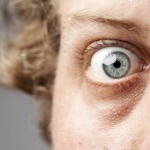 OK, so you are now well down the track to an effective digital marketing strategy. Your business goals are clear, your strategy is set, your internal and external resources are aligned, and you have clearly identified your brand persona and approach to customer segmentation. In this Chapter we focus on developing compelling digital marketing ideas in this new collaborative era. You must now concentrate on bringing your strategy to life. Traditionally, brand agencies developed the overarching brand ideas and left it to other disciplines, including the digital teams, to adapt the media work. However, this is no longer effective as it ignores the two-way nature of digital channels and the need for an ongoing journey of discovery rather than one-off, one-way push communication. Consequently, traditional brand and advertising agencies have started creating engaging digital campaigns (albeit not necessarily with the deepest specialist skill set or strategic foundation). Goodby, Silverstein & Partners, for example, went from collecting 80% of its revenues in 2011 from traditional advertising campaigns and less than 20% from digital initiatives, to a 60/40 traditional/digital split only 12 months later. The agency landscape has also seen micro-agencies being set up due to the inflexibility and lack of speed-to-market that characterise the global ad agency behemoths. Utilising open innovation, crowdsourcing and co-creation, one or two people can create an agency without the rigid structures, processes and egos that can constrain great ideas in the biggest firms. Before we explore these dimensions, here’s a case study to whet your appetite. Victors and Spoils (V&S) is a relatively new Colorado-based agency that was founded in 2009. It claims to be the first creative advertising agency built on crowdsourcing principles, with a 7200-member community. In 2011, V&S was keen to win Harley-Davidson’s business after hearing that the motorcycle manufacturer had split with its agency of three decades, Carmichael Lynch. But instead of joining the pitch list, V&S proactively created a brief and posted it to its thousands of creatives and strategists, made up of freelancers, moonlighters from other agencies, and brand and advertising enthusiasts who’d all opted to work in the new open model. ‘Six hundred ideas flooded in’, claimed V&S CEO John Winsor. He apparently tweeted Harley-Davidson’s CMO to explain what they were doing and the CMO replied, ‘Go for it’. V&S ended up presenting 65 ideas and won the business (source: The end of traditional ad agencies). Let’s now examine more closely these new ways of working in the digital world. As you saw in the V&S example, creative ideation is changing. However, while the process is being transformed, it has never been more critical to have a compelling creative idea that connects with your consumers. This is because in our digital world, we have seen a huge increase in the number of ads and other communication that we are receiving. There is more ‘noise’ than ever before, which means that fewer and fewer messages are sticking. So to be successfully received, your creative idea must be focused, simple and emotionally engaging. If you can tap into a human truth and human emotions, you stand a better chance of connecting. To do this, let go of the creative director ego and the ‘one-way’ mentality – TV ads are still important, but they are now merely one part of the creative jigsaw puzzle. Instead, become open to collaboration and the two-way journey of creative discovery. The creative idea is just the start of the process – the goalposts, to use a sports analogy. You can’t stop at creating a one-dimensional advertisement and expect consumers to do the rest. You must now take your customers on a journey of brand, product and service discovery. You need to develop a story with different (and relevant) touchpoints throughout all the different stages of the consumer life cycle. Content marketing is fast becoming the new advertising playground, with editors, journalists and specialist writers creating annual content calendars and more-compelling stories than any agency writer could ever dream of. Companies such as Story Worldwide, Redwood, Edge Custom and King Content are radically changing the agency landscape and turning marketers’ heads by presenting brands as stories. These agencies also allow user-generated content to be integrated into the story – when consumers create their own content, relating their own experiences and stories about your brand, they are buying into the business direction that you desire. It’s a wild, confronting and confusing world when it comes to digital technology. And it’s changing by the hour. 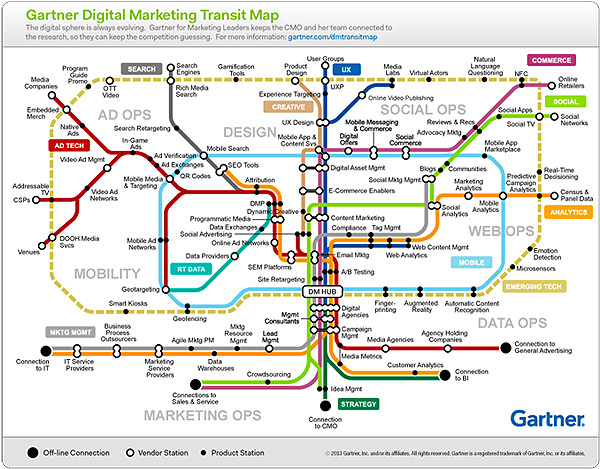 To help those whose heads are spinning with all the new developments, Gartner has created a digital marketing transit map that nicely summarises some of the more important technologies, relationships and providers. Needless to say, it is critical that you incorporate specialists within your business who can demystify and assess the external specialists that you might utilise. As we pointed out earlier in this guide, technology solutions need to be assessed from a business-value perspective, not from the viewpoint of ‘technology for technology’s sake’. In terms of creative ideation, that means partnering your creative teams with a technologist who will build their understanding and challenge their thinking, helping them to bring ideas to life with relevant forms and touchpoints that will positively impact your target market and their brand experience (customer journey). Just as qualitative focus groups used to unearth consumer insights, now data is the new playing field. But a crucial point here is that it’s not the fact that you have lots of data that is exciting. ‘Big data’, as it has come to be known, is useless if it doesn’t help improve the customer experience, as well as point you towards better insights and solutions. Data insight-gathering is an art as well as a science. Algorithms and models may not be the best way to unearth golden trends. Focus more on the questions you want to ask and the hypotheses you have, or on direct feedback from customers, and then mine your data for proof or valid insights. The key is to look for major trends and not, so to speak, to ‘major in the minors’. Paths with minimal differences or impact are not worth following. You should be looking for the foremost trends within each of your segments to bring to light real business opportunities. Now that you are equipped with an understanding of the new 4D model, you can begin to determine what resources you require. Should you outsource to a general advertising or brand agency group with a myriad business entities, or should you focus on one or more specialist agencies? The marketer selects a single service provider to deliver all of their marketing communications requirements. One of many holding companies, either global or regional, provides from within their portfolio of companies a customised package to fulfil the marketer’s needs. The holding company accesses prime resources across multiple companies to create a new virtual or real service-provider entity. This operates on a local, regional or global basis. A key strategic service provider takes responsibility for managing and coordinating all service providers for the brand. This can also be structured to factor in all service providers from the one holding company. This involves taking a holistic approach to the supplier portfolio, providing access to the required range of services in a more manageable, structured approach. This can also be structured using all the service providers from one holding company. Representatives from the core strategic suppliers form a management group to coordinate strategy development and implementation. This can also be structured using all the service providers from one holding company. The marketer identifies and selects the suppliers required to deliver the necessary capabilities and services from the total supplier population. These models are further defined and reviewed in the TrinityP3 SlideShare presentation Agency Supplier Roster / Portfolio Structures. 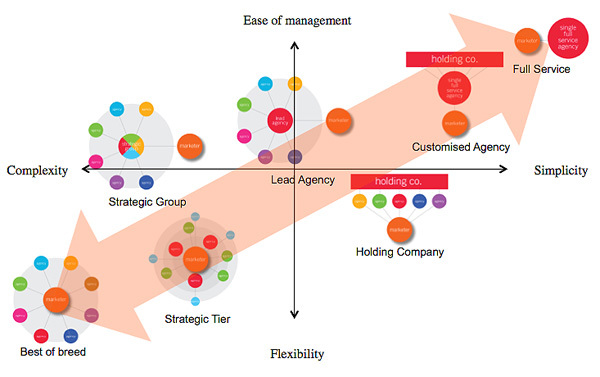 In comparing these models, the key question is: What is the best structure for delivering the strategic and creative capabilities required in the most cost- and time-efficient manner, and which results in the most effective marketing outcome? 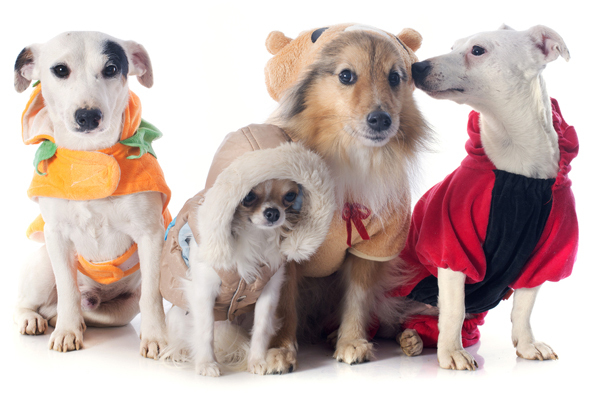 In answering this question, marketers often find themselves considering a trade-off between the convenience of a single agency supplier and the depth of expertise offered by a range of specialist, best-of-breed service providers. Ultimately, the ‘best’ model will depend on the strategic requirements of the marketers and the brand, the geographic scope of the operation, and the resources and skills that are needed. By referring to the Requirements/Capabilities Matrix and a preferred supplier structural model, an implementation plan can now be developed for transforming your current practice. To sum up this chapter, it is important to understand that the creative ideation process has changed dramatically in recent times. 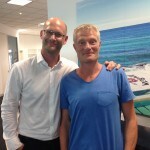 Gone are the days of one creative team solving all your challenges, developing a TV ad concept and then going to lunch. Now it is imperative that you develop two-way ideas that engage consumers. 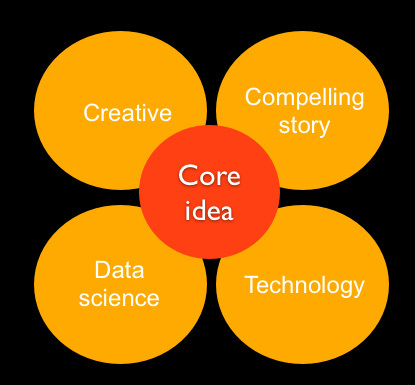 To accomplish this, right from the beginning, you have to utilise the collective talents of creatives, story writers, technologists and data scientists. The next chapter will look at how to develop an ongoing journey of discovery otherwise known as the never-ending campaign. It will also cover living in beta – the ability of brands and their stories to iterate and evolve, content calendars, crisis management and more. You can read Chapter 7 here.